I have new crush. It’s funky, arty, original and from Belfast. I am officially in love with all things ReFound. 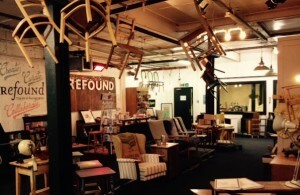 ReFound specialises in recycled, upcycled and industrial vintage everythings. I’ve been mouching around their website – ReFound Online, and the place is amazing. A mix between a gallery and a shop, ReFound sources classic, vintage and industrial style furniture and up-cycles and re-purposes pieces to produce one-off stylish furniture, lighting and accessories. As if they’re not cool enough, they also work with local artists and designers, to create one-of-a-kind functional artworks. The ReFound website is beautiful but equally I’ve promised myself a trip to their bricks and mortar shop at 1 – 5 Albert Square up the road in Belfast. I’m having a great week for making wishlists – having admitted my craving for a vintage coat rack on my friend Bumbles of Rice’s post – What Real Women Want for Christmas, so here’s a few beauties selected from the stash on Refound Online. All images – and my aren’t they pretty, are courtesy of ReFound. From left to right from the top down there’s: the funky Vintage Bell hanging light (£49.99); Mason Jar Lights (£40.00); a cool print featuring a quote from Jane Eyre “I would always rather be happy than dignified” printed on original page from a vintage copy of the fabulous book (£24.00); the retro floral chair (£165); this cool spotty table by Anushiya Sundaralingam (£145.00); an iPad / book block made from reclaimed wood (£22.00); the Duo Cutlery Handle Pendant by Elephant Juice – which I’m seriously tempted to buy for myself (£52.00); the very brilliant recipe notebooks “Food I’m Likely To Burn” (£11.00); a beautiful Retro cushion cover in blue (£30.00); a vintage storage unit (£90.00) that is crying out to house my stash of wool; linen Ail+El Towels printed in Dublin (£15.00). And just to prove that the ReFounders are are lovely as they are stylish here are two treats. First you can avail of 10% off between now and 19th December with the discount code BUSYMAMA10. Secondly, five lucky readers are being offered one of these funky tote bags shown above which are exclusively available through ReFound. To enter just click below and follow the instructions. The competition closes at midnight on Tuesday 15th December and winners will be announced the following day. Please note entries are limited to postal addresses on the island of Ireland. I was not paid to write this post. I am hosting this competition but prizes will be posted direct to winners by Refound Online. Competition entries are limited to postal addresses on the island of Ireland. The discount code is available on the shop website and active until Saturday 19th December. Oh the vintage bell light, it’s fabulous…..actually everything is, I’m off for a proper gander! Didn’t spot this earlier – I’m in! Wow, what a fab site! I know!!! I literally love everything! Entered! Fab prize! my 0 hone kept messing up so if I’ve entered 70 times I’m sorry…. I do love an honest cheat!!!! !